In Frómista, after crossing the Canal de Castilla the pilgrims will reach one of the most important examples of civil (hydraulic) engineering, constructed between the mid-eighteenth century and the first third of the century. With its 207 kilometres, the canal covers the provinces of Burgos, Palencia and Valladolid and was built to facilitate the transportation of wheat from Castile to the north. A great dream of the Enlightenment period, it attempts to unite Segovia with the port of Santander. The constructions heyday took place between the years 1850-1860 when the boats that navigated the channel exceeded 350. However, the opening of a railway line with a path nearly parallel to the canal led to a cease in its expansion. The province of Palencia accounts for the most kilometres of the channel and within it, Frómista is one of the most important stops in the area, given that it has the largest set of existing locks and is of great beauty. Also on the outskirts, but not in the actual path, the chapel of Santiago and Otero is located, of gothic taste inside it shows an image of the Virgin del Otero, highly revered. Now in the enclave the pilgrims continue the route through the neighbourhood of the Canal to link, immediately afterwards, with Avenida Carmen Montes, where they will find the first services in the locality. On the right, at the highest point of the town, they leave the church of Santa María del Castillo, of Gothic style and built on an ancient fortress. Its main altarpiece stands out with paintings on a panel from the XV century. 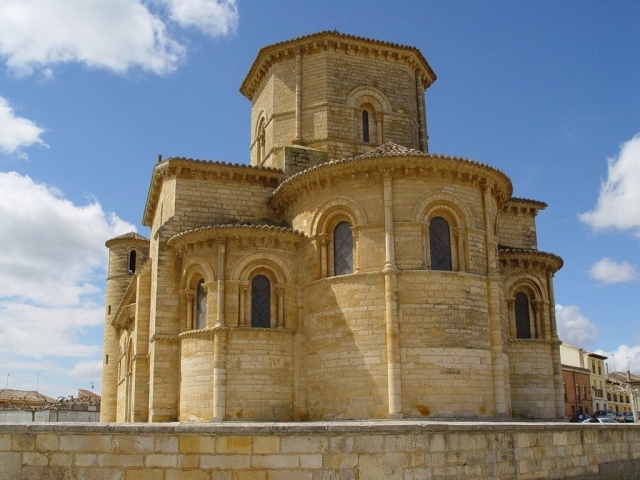 The church also houses the multimedia museum 'Vestigia, Leyenda of the Camino ". This is a permanent exhibition and through a journey of about 35 minutes in this ancient church, recalls the origins and history of Frómista, Jacobean legends and treasures safely guarded in the temple. Multimedia projections are at 12.00, 13.00, 17.00 and 18.00 hours. On arriving at the junction with the Avenida del Ejército, to follow the pilgrim path walkers should continue straight ahead, on the Paseo Julio Senador, although on this route they move towards the exit of the enclave. San Isidoro de León and even the cathedral of Santiago de Compostela. Its origin lies in the Benedictine monastery founded by Doña Mayor, Countess of Castile and the Queen of Navarre in 1066. From perfect shapes and proportions to great architectural beauty, inside the church visitors are met by the rich ornamentation of its capitals, with iconographic themes of vegetables and 309 decorative corbels-small sculptures that decorate the eaves of the roof, with geometric representations of animals, monsters and humans. Its three naves are covered by a barrel vault and have semi-circular apses, with an octagonal dome and a lantern reminiscent of Byzantine and Lombard. The visit to the temple costs one euro for pilgrims with the credential. In summer it opens from 09.30 to 14.00 and from 16.30 to 20.00. 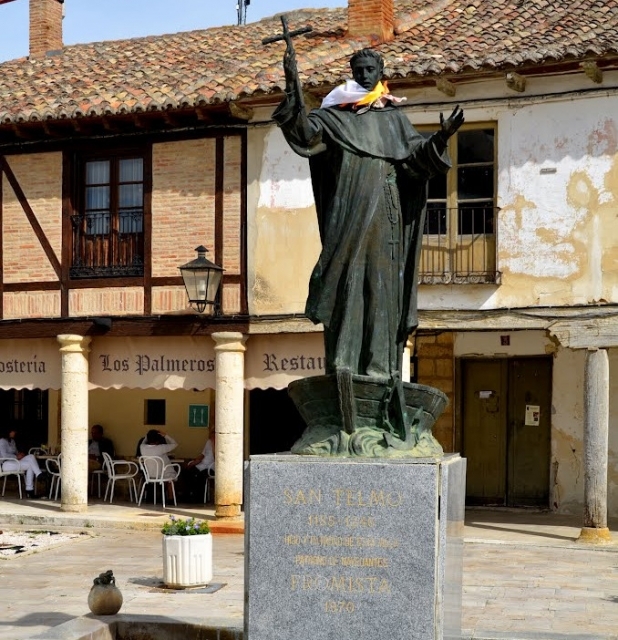 If they leave the temple to the square and head towards the street of El Milagro the pilgrims will find the so-called "Miracle Stone", a milestone that recalls, in front of the house of Pedro Fernandez de Teresa the miracle starring this Christian in the year 1453. Frómista is also known by the nickname of Villa del Milagro. Legend recalls how Pedro Fernández de Teresa asked in the mid XV century to borrow money from a Jew. In the middle Ages the Jewish community of Frómista was very prominent and eventually grew to about 1,000 people. The loan and the deadline were agreed, however the Christian did not return the money. Consequently the Jew denounced him to the ecclesiastical authority and he was excommunicated (refused him communion). Faced with this situation the Christian returned the money and assumed that this would be enough to remove his religious punishment, he forgot to communicate the re-payment to the authorities. Later, after falling ill, Pedro Fernandez asked for a confession with the priest of San Martin, the priest responsible for reading Christians their last rites. But when the pastor attempted to give him the Eucharistic bread he was unable, it seemed to be glued to other pieces with such force that he could not separate it. The priest then asked the Christian if he had hidden some sin or if he was excommunicated. Pedro recalled what had happened and explained. The priest absolved his sins and gave the communion by using a different piece of sacred bread and not the first that he was unable to detach from the ciborium. This one is still preserved in the Museum of the Parish Church of San Pedro. The miracle achieved great fame and in turn led to a popular devotion. Not far from here, the walkers reach the Square Plaza de Tuy, where the Church of San Pedro (XV century) is situated, of Gothic style and with a Renaissance façade designed by Juan de Escalante. The temple houses, in one of its side chapels the Museo parroquial (Parish Museum), open from May to the 12th of October, from 10.00 to 13.30 and from 16.00 to 20.00 hours. Here pilgrims can admire a collection of 29 pictorial boards of Hispano-Flemish style. In the church of San Pedro there are officiated Masses during the summer from Tuesday to Saturday at 20.00 and on Sundays at 13.00. 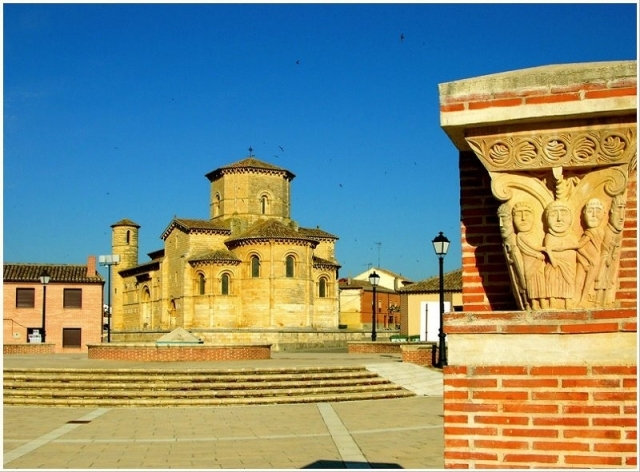 On Wednesdays from the 8th of May there is a service in the church of San Martín at 20.00. Each day, at the end of the Eucharist a Benediction is performed for Pilgrims. The square is also home to the historical-ethnographic museum, admission is free, the museum covers the history and evolution of traditional crafts of the region through exhibiting tools, implements, old constructions, and machinery, in total it features more than 500 pieces. Although a little further away from the French Camino, in the centre visitors can also visit, in Ronda de San Pedro, a former granary, a store that held two tons of cereal to give to the poorest farmers and to ensure they had grain to sow in times of famine.